Lu, N., Yang, G., Chen, J., Wang, Q., Pei, L., and Lucia, L. A. (2017). "Producing hydrochar from cotton linter black liquor and performing alkali recovery," BioRes. 12(2), 3666-3676. Holistic utilization of cotton linter black liquor is crucial from both economic and environmental standpoints. For this purpose, the hydrothermal conversion process was selected to produce hydrochar from organic materials dissolved in black liquor. Fourier transform infrared spectroscopy (FT-IR) analysis showed that there were no significant functional changes in the hydrochar compared with black liquor solid (BLS) at different preserving temperatures. However, a C-O bond was ruptured by the hydrothermal carbonization. Thermogravimetric analysis also showed that the thermal stability of the hydrochar was increased. 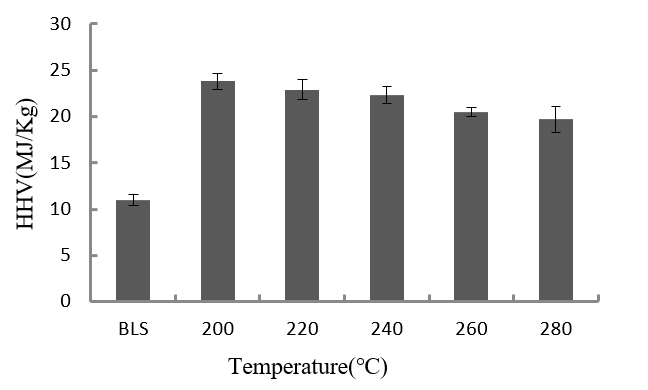 The higher heating value (HHV) of hydrochar at the different preserving temperature from 200 °C to 280 °C was higher than BLS, reaching a maximum at 200 °C. On the other hand, the alkali from the liquor production of hydrothermal carbonization was recovered by causticization; the highest causticizing efficiency (CE) was 45.2%. The recovered liquor alkali can be used in pulping or pretreatment strategies. The major wastes in black liquor include organic acid, esters, ketone, resin, wax emulsions, and fatty soaps (Schorr et al. 2014; Kumar and Alen 2015; Manttari et al. 2015). There are many ways to treat cotton linter black liquor, including precipitation, acidification, oxidation, and biological treatment (Gao et al. 2013; Tekin et al. 2014). Aerobic-anaerobic-aerobic biological treatment is used to treat black liquor after the recovery of lignin (Lihong et al. 2009). Microelectrolysis is used in a sequencing batch reactor (SBR) (Duan et al. 2012). Calcium chloride pretreatment can be used in coordination with polyaluminum chloride (PAC) and polyacrylamide (PAM) flocculation to decrease chemical oxygen demand (COD) (Xu et al. 2003). Fenton oxidation can be used to treat the cotton linter black liquor (Zhao et al. 2010). Although these treatments achieve some effect in environment protection, they are not ideal because the final wastewater discharge does not attain the first grade national standard. Additionally, alkali cannot be recycled, thus contributing to a serious waste of resources. New ways to treat cotton linter black liquor are currently under exploration. Membrane separation and causticizing combustion are relatively ideal methods for alkali recovery (Xin 2005). For instance, ultrafiltration membrane separation can treat the cotton linter black liquor via pretreatment (flocculation), sedimentation, coarse filtration, and membrane filtration. The COD removal rate is 80%, and the alkali recovery rate is 85% after treatment. If the alkali of cotton linter black liquor is recovered by combustion, a heat source or a change in the combustion process must be added due to its low calorific value and high viscosity, but this is not suitable for industrialized production due to higher costs. Thus, alkali recovery and the efficient utilization of cotton linter black liquor has been problematic (Zhang et al. 2011; Wang et al. 2013a, b). Recently, hydrothermal conversion has been emerged as a thermal conversion technology that translates biomass into high value-added products (Calzavara et al. 2005; Williams and Onwukili 2006; Naqvi et al. 2010). In addition, hydrothermal conversion is a green way of producing carbon because of its mild reaction conditions, simple operation, no need to dry raw material, and use of water as the reaction medium (Sugano et al. 2008; Sricharoenchaikul 2009; Rönnlund et al. 2011). Thus, hydrothermal conversion is an effective way to treat the black liquor of cotton linter; it avoids pollution from the direct environmental discharge of cotton black liquor and produces high value-added black liquor organics (Ross et al. 1991; Funke and Ziegler 2010). Hydrothermal carbonization reaction to treat the soda pulping black liquor of cotton linter can also be used to obtain high calorific value hydrochar. In this study, the soda pulping black liquor of cotton linter was used as raw material to produce hydrochar. 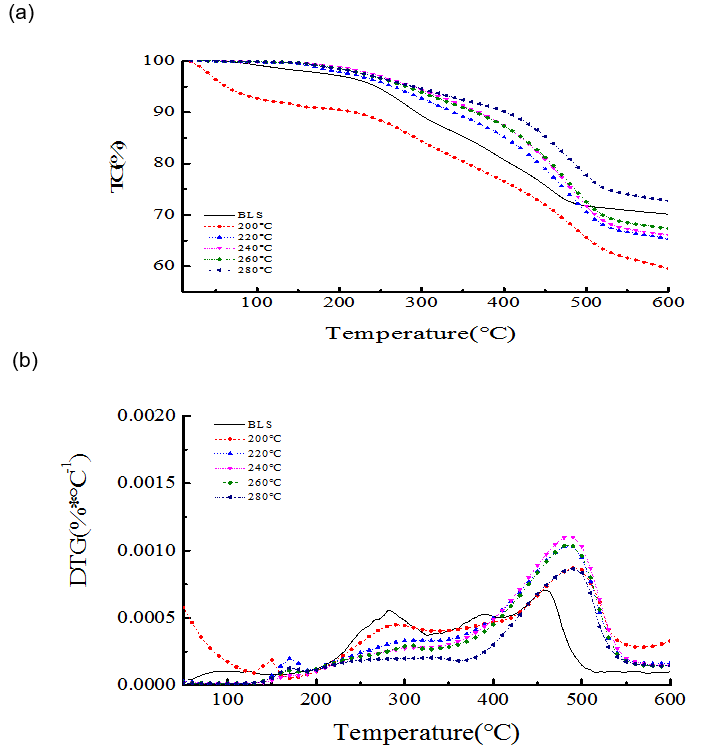 The properties of the hydrochar achieved at different temperatures were analyzed, and the feasibility of alkali recovery of the hydrothermal carbonization liquor was examined. Cotton linter black liquor was obtained from Shandong Henglian paper industry group (Weifang, China). It had the following characteristics: pH, 13.4; CODCr , 1.32 × 104 mg·L-1; biochemical oxygen demand of 5 days (BOD5), 3.91 × 103 mg·L-1; higher heating value ( HHV), 11.4 MJ/kg; lignin content, 4.0 g.L-1; polysaccharide content, 9.41 g.L-1; and total alkali content, 32.6 g.L-1. A laboratory scale 250 mL Parr stirred pressure reactor (Parr, USA), equipped with a temperature controller and indicator module of pressure and stirrer rate, was used for hydrothermal carbonization. Initially, 50 mL cotton linter black liquor was put into the reactor. The reactor was heated to the different temperature of 200 oC, 220 oC, 240 oC, 260 oC, and 280 oC and maintained for 8 h at pressure conditions of 1.4 MPa CO2. Once the reaction was completed, the reactor was quickly cooled down to room temperature. The hydrochar was recovered by filtration with G3 filter (sand core funnel) and oven-dried at 105 °C for 24 h.
For KBr pelleting, approximately 1 mg of sample and 300 mg of KBr were mixed in an agate mortar. After porphyrization, a small amount of the sample was placed into the sample groove to form a homogeneous structure and highly transparent flake. The analyses were performed on an IRPrestige-21 FT-IR spectrophotometer (Shimadzu, Kyoto, Japan), the scan range was 4000 to 600 cm-1. An Agilent 7890B-5977A system equipped with a HP-5MS capillary column (30 m × 0.25 mm, 0.25 µm film thickness) GC-MS (Palo Alto, CA, USA) was used. The experimental conditions were as follows: split ratio, 10:1; column temperature, 50 °C for 2 min, increase to 160 °C at a rate of 10 °C/min for 2 min, increase to 260 °C at a rate of 20 °C/min, hold for 2 min. Thermal analyses were performed on a TGA Q50 (TA, New Castle, DE, USA). Approximately 5 mg of sample was placed in a sample pan, and the temperature was increased from ambient temperature to 600 °C. The heating rate was set at 20 °C/min under nitrogen with a flow rate of 60 mL/min (Zhang et al. 2015). Elemental analysis of samples for carbon (C), hydrogen (H), oxygen (O), nitrogen (N) and sulfur(S) were carried out on a Vario EL III Elementar (Elementar Analysen Syetem GmbH , Germany). The HHV was calculated from the Channiwala and Parikh formula (2002) (Eq. 1), which is generally accepted for its broad fuel applicability and high accuracy, i.e., an average absolute error of 1.45% and bias error of 0.00%. where C, H, S, O, N, and A represent carbon, hydrogen, sulfur, oxygen, nitrogen, and ash content in wt.%, respectively. Cotton linter was used as the raw material in this research. Alkaline pulping was carried out in the 15 L electric heating boiler (Tongda, Xianyang, China). COD and BOD were measured by the dichromate closed reflux colorimetric method and dilution method, respectively (Clescerl et al. 1999). Lignin content was measured according to TAPPI T222 om-88 (1988). FT-IR was used for a qualitative analysis of black liquor solids (BLS) and the hydrochar (Fig. 1). There were no significant functional changes in the hydrochar relative to BLS. The peak at 1124 cm-1 disappeared, which indicated that C-O bonds (glucosidic, methoxyl, or ether) were broken (Kang et al. 2012), causing the oxygen content of hydrochar to decrease. The peaks in the range 2800 to 3000 cm-1 were enhanced, which resulted from saturated alkyl bonds and organic unsaturated bonds increasing. The benzene peak at 1510 to 1600 cm-1, and its C-H vibration peak appeared over 700 to 900 cm-1, were weakened in comparison with BLS. When the temperature was between 200 and 260 °C, the FT-IR of hydrochar was relatively stable, but when it reached 280 °C, hydroxyl peaks increased, showing that the hydrothermal carbonization reaction of the black liquor had changed. Although the BLS and the hydrochar lost mass during heating within the range 250 to 500 °C (Fig. 2), the weightlessness peaks of hydrochar shifted to the right compared with the BLS. This result demonstrated that the thermal stability of the hydrochar increased, and its stability was better at higher preserving temperatures of hydrothermal carbonization. On the other hand, the onset and endset temperature was calculated by extrapolating on the basis of the intersection of two tangents to the TG curves (Tran et al. 2017). The onset and endset temperature for BLS was 75 oC and 475 oC, respectively, which was 160 oC and 525 oC for hydrochars from 220 oC, 240 oC, 260 oC, and 280 oC. The thermal stability of the hydrochar was related to the production of its volatile components, carbon content, and the ash content. Lower levels of volatile components and higher ash and carbon contents were correlated with improved thermal stability. Table 1 and Fig. 3 show that the HHV of the hydrochar was higher than that of the BLS. Also, the hydrochar HHV slightly decreased with increasing holding temperature. The maximum hydrochar HHV occurred at 200 °C. The total alkali content of cotton linter black liquor and the hydrothermal carbonization liquor produced at different temperatures are shown in Table 2. The total alkali was 96.8 g·L-1, and the range of the total alkali content of the hydrothermal carbonization liquor produced was 77.9 to 93.1 g·L-1. Although CO2 could be used to acidify the BL, the metal ions were mainly dissolved in the liquor. The Na+ in alkali lignin dissolved in black liquor to produce NaHCO3. In hydrothermal carbonization, lignin and other organic materials generated hydrochar through decarboxylation, dehydrogenation, and polymerization. Upon heating NaHCO3, it decomposed to Na2CO3. The total alkali content decreased, which showed that a part of the alkali was in the hydrochar. After the reaction, the effective alkali content in the hydrothermal carbonization liquor was no longer detectable. The pH of the hydrothermal carbonization liquor was 8 to 9, which was lower than the black liquor (13.4). This was because a low molecular weight acid was generated in the reaction. This reaction, in addition to the CO2 acidification, lowered the pH. The GC-MS results at 200 °C are shown in Figs. 4 and 5. 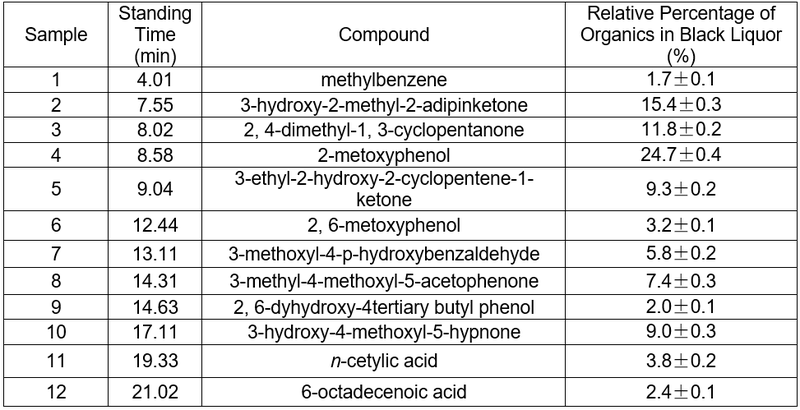 Tables 3and 4 show that butyric acid, benzene acetic acid, and other low molecular weight acids were produced. The low molecular weight acids promoted hydrolysis of the Na2CO3. The pH of the sodium carbonate solution was 10, while that of the sodium bicarbonate solution was 8.2. The pH of the hydrothermal carbonization liquor was 8 to 9 because the buffer pair of Na2CO3 and NaHCO3 were present. CaO can react with Na2CO3 and NaHCO3 to produce NaOH, which is a valuable approach toward valorizing hydrothermal carbonization liquor for alkali recovery. The chromaticity of liquor of the hydrothermal carbonization was examined by dilution multiple analysis (Table 5). The chromaticity decreased with temperature, but the change was slow. The color of the liquor was still very deep. 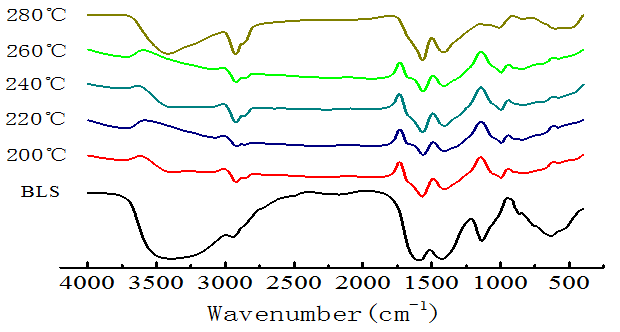 Thus, the influence of the reaction with respect to chromophoric groups could be ignored at different temperatures. The color of black liquor was partly due to coniferyl alcohol and methyl ethers from lignin. The GC-MS results in Table 5 suggest that the color of black liquor may have been impacted by methyl ether. The black liquor had significant levels of 2-methoxyphenol, 3-methoxyl-4-hydroxy, benzaldehyde, and 3-methyl-4-methoxyl-5-hypnone, whereas the hydrothermal carbonization liquor contained noticeable levels of 2-methoxylphenol, 1,4- butanedioic dihydroxy oxime acid methylbenzene, and 1,4-methoxyl-2,3-methyl benzene. The content of the effective alkali and the alkali recovery efficiency are shown in Table 6. Causticization of the hydrothermal carbonization liquor was found to be a useful way to recycle the alkali. The recovery rates were 36.2% to 45.2%. The recovery rate was directly proportional to the total alkali content when the total alkali content was less than 93.7%. The pulping conditions are shown in Table 7. The blank group represented pulping with standard alkali, and the experimental group had alkali recovered liquor and distilled water with a volume ratio of 1:1. The amount of sodium hydroxide in the experimental group was equal to the amount of sodium hydroxide in the blank group minus the amount of sodium hydroxide in the recyclable alkaline solution. The pulping results showed that the two groups produced acceptable pulp. This suggested that the hydrothermal carbonization liquor could be applied in pulping. Moreover, the pulping water was reduced by approximately 50%, whereas pulping alkali saved 41.6% of the total. The hydrothermal conversion of cotton linter black liquor to produce hydrochar was investigated in this study. FT-IR demonstrated that there were no drastic changes in function groups in the hydrochar compared with the solid content of cotton pulp black liquor, except that the peak of the C-O bond disappeared. When the preserving temperature was 280 °C, the peak of the hydrochar increased, indicating that the hydrothermal carbonization reaction had changed. TGA showed that the thermal stability of the hydrochars produced by different temperatures was improved in comparison with BLS. 2. The alkali recovery was performed on hydrothermal carbonization liquor. The total alkali in black liquor was 96.8 g·L-1, whereas the range of the total alkali content from the hydrothermal carbonization liquor at different temperatures ranged from 77.9 to 93.1 g·L-1. The pH of liquor was reduced, while the influence of the reaction on chromaticity of the cotton linter black liquor was negligible over the range 220 to 280 °C. The causticization of hydrothermal carbonization liquor was found to be a promising method to recycle alkali in the liquor. The highest alkali savings rate was 41.6%, which could be reused for pulping. This work was supported by the National Science Foundation of China (Grant Nos. 31470602, 31670595), and the Taishan Scholars Program of Shandong Province. Clescerl, L. S., Greenberg, A. E., Eaton, A. D. (1999). Standard Methods for Examination of Water and Wastewater (20th Edition), Washington, DC: American Public Health Association. Gao, Y., Yue, Q., Gao, B., Sun, Y., and Wang, W. (2013). “Preparation of high surface area-activated carbon from lignin of papermaking black liquor by KOH activation for Ni(II) adsorption,” Chemical Engineering Journal 217, 345-353. TAPPI T222 om-88 (1988). “Acid-insoluble lignin in wood and pulp,” TAPPI Press, Atlanta, GA.
Wang, R., Zhang, A., and Lv, X. (2013a). “Treat the cotton pulp black liquor with alkali recovery process,” East China Pulp & Paper Industry 44(5), 10-12. Wang, X., Liu, J., Ge, H., Yuan, M., and Luan, Y. (2013b). “Engineering of alkali recovery in cotton pulp black liquor treatment,” China Water & Wastewater 29(22), 116-118. Xin, Y. (2005). “The cotton pulp black liquor treatment technology,” Artificial Fiber 35(3), 23-25. 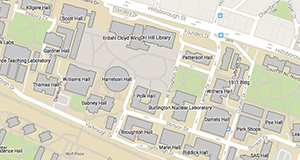 Xu, M., Hu, H., Liu, Q., and Yi, X. (2003). “Application of CaCl2 as flocculation-aid in cotton pulping black liquor treatment,” Paper Science & Technology 22(2), 27-29. Zhang, K., Zhang, Q., Cheng, Y., Huangfu, Z., and Li, J. (2011). “Application of alkali recovery technique in wastewater treatment of cotton pulp industry,” China Environmental Protection Industry 2, 30-31. Zhao, L., Jin, R., Sun, H., and Gao, Y. (2010). “Advanced treatment of cotton pulp black liquor by Fenton oxidation technique,” Industrial Water Treatment 30(6), 48-51. Article submitted: December 9, 2016; Peer review completed: March 12, 2017; Revised version received and accepted: March 24, 2017; Published: March 29, 2017.